Unless otherwise indicated, all rights (including copyright) in all content, other material and compilations contained in, or used to create or support this site including text, graphics, logos, button icons, video images, audio clips and navigational and other software (collectively referred to as the Contents) are owned or controlled, and are reserved by Garage Gate Remotes and its related companies, affiliates, licensors and licensees. Using this site as a shopping resource, provided that you do not modify the site and that Garage Gate Remotes retains all copyright and other proprietary notices contained in the Contents. You are not authorised, without the prior written permission of Garage Gate Remotes and each other owner of rights in content that you access via the site, to reproduce, frame, download, store (in any medium), communicate, show or play in public, adapt, change, or create a derivative work from that content. No trade mark (whether registered or otherwise) that is contained on this site or otherwise used by Garage Gate Remotes may be used without our prior, specific, written permission or that of the trademark owner. You agree to take responsibility for the safekeeping of your user name and password. You are liable if your user name or password is used by an unauthorised person. You agree to release and indemnify Garage Gate Remotes in connection with any use (whether authorised or unauthorised) of your user name or password. Garage Gate Remotes may suspend or cancel your account at any time without prior notice. You grant Garage Gate Remotes an irrevocable, non-exclusive licence to use any material, information and ideas that you transmit to this site or otherwise provide to Garage Gate Remotes from the time you authorise it to be sent. You agree that we can use and adapt any ideas, concepts, techniques, words, images or other content contained in these transmissions for any purpose and without restriction or compensation. breaches any standards, content requirements or codes promulgated by any relevant authority, including authorities that require Garage Gate Remotes to take remedial action under any applicable industry code. Garage Gate Remotes reserves the right to restrict sales to retail quantities when supplying resellers and distributors. Your order and credit card details are safe and secure. All personal and credit card information provided to Garage Gate Remotes is encoded using Secure Sockets Layer (SSL) technology, an encryption protocol that protects data as it travels over the Internet. At this stage we can only accept payments using the methods stated in the Purchasing & Payment section of firststartbatteries.com.au. We are unable to accept COD charges. Payment must be cleared before the goods are dispatched unless you have approved credit facilities with Garage Gate Remotes. All orders placed through this website are subject to confirmation and acceptance by Garage Gate Remotes. We may vary prices in the event of price changes or mistakes made by suppliers on reasonable prior notice to you. If we request payment for increased prices, you may cancel the order by giving notice to Garage Gate Remotes, which must be received within seven days of the announcement of the increase. Garage Gate Remotes or its agent will deliver the goods you order to the address you specify in your order, within the agreed time frame, subject to their availability. Where the goods are not available we will notify you of this as soon as possible. Anyone at the delivery address who receives the goods will be presumed to be authorised to receive the goods. If your goods include products in respect of which the law prescribes a minimum age for purchase, you must be over the age of 18 years (or such other minimum age as is prescribed by the law), and you must ensure that a person over that age is available to accept delivery of the goods. Garage Gate Remotes may refuse to deliver the goods if the person receiving the goods is unable or unwilling to provide evidence of proof of age. If there is no one at the delivery address or no one of appropriate age to receive and pay for the order, Garage Gate Remotes may charge you additional delivery fees. Title to the goods purchased on this site does not pass from Garage Gate Remotes to you until we have received payment in full for the goods. All risk in the goods passes to you upon delivery. All product returns are subject to Garage Gate Remotes Warranty and Returns Policy, which forms part of these terms and conditions. Garage Gate Remotes aims to include up-to-date pictures and specifications of all of the goods on this website. However, our picture and/or description of the goods may differ from the actual goods. We recommend you read the labels on the goods carefully before using the goods. If your order is unsuccessful because the stock has been purchased by an order prior to yours, Garage Gate Remotes is not required to supply you with any alternative products and has no liability to you whatsoever. Garage Gate Remotes is providing this site and its contents on an 'as is' basis and use of this site is at your own risk. The content is believed to be accurate, complete, current and reliable at the date the information was placed on the site. 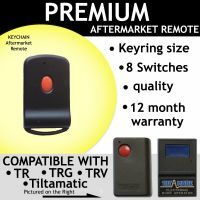 Garage Gate Remotes and its related companies, affiliates, licensors or licensees, and their respective directors, officers, employees or agents make no representation or warranty as to the accuracy, completeness, currency or reliability of the information contained on this site (including in relation to any products or services). To the extent permitted by law, including any non-excusable statutory obligations, none of them will be liable or responsible in any way (including in negligence) for errors in, or omissions from, the information contained on this site. To the extent permitted by law, Garage Gate Remotes expressly disclaims all warranties of any kind, whether express or implied, including (without limitation) implied warranties or conditions of merchantability or fitness for purpose. Your ability to purchase goods from this site may be terminated by Garage Gate Remotes at any time without notice. All restrictions, licences granted by you and limitations of Garage Gate Remotes liability will survive termination.